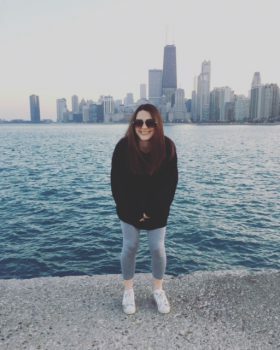 Growing up in the southwest suburbs I was not entirely unfamiliar with the Windy City, however, I’ve learned that visiting Chicago and living in Chicago are two completely different things. Spending just one day in the city does not compare to the excitement of living here for an entire semester. Chicago has been one of the best adventures that I have had during my college career. Exploring different neighborhoods in class, on the weekend, and through my internship has allowed me to get to know the city in a way that I never have before. Navigating the CTA has been just one of the many challenges of getting to know Chicago. As a program we have spent time volunteering at the Greater Chicago Food Depository, attending Bulls games, and even going to fine arts events throughout the city. I am currently working at Heartland Alliance in the Refugee and Immigrant Community Services office as a medical case management intern. This internship has made me appreciate different cultures and the diversity in this world, and in this city, so much more than I ever could have imagined possible. Working with such a resilient population has truly been a privilege. Spending 8+ hours every day learning the ins and outs of this agency has been exhausting but entirely rewarding at the same time. Nothing has brought me more joy this semester than being able to serve the participants at Heartland in any way that I can. After graduation I will look back fondly on my time spent living, learning, and working in Chicago. I am forever grateful for the lessons I’ve learned, the friends that I’ve made, and the love that I’ve grown to have for Chicago. I am lucky to have been a part of such a wonderful program that is so dedicated to presenting college students with such amazing opportunities and life experiences.